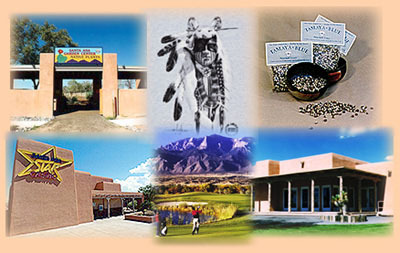 Santa Ana Pueblo Tribal Enterprises including apparel, Native American foods, Indian gaming, championship golf course, 4-star restaurant, garden center and wholesale nursery. Agriculture is why the Santa Ana people have survived as a community. More than just the management of soils and crops, agriculture is an integral component of our lifestyle and religion. The cycle of religious ceremonies reflect the agricultural seasons. Blue corn, the most treasured grain of Pueblo tribes, is the prominent crop of Santa Ana. We, theTamayame, are excited to share our native blue corn products with you. In addition, we offer you a variety of American Indian food products such as teas, smoked salmon, wild rice, honey, stews and chile from other Native peoples in the Southwest and across the nation at The Cooking Post. Santa Ana operates a nursery to produce native plants for the sunny, semi-arid Southwest climate of the mid-Rio Grande Valley region. We offer perennials, annuals and biennials, grasses, trees and shrubs, vines, and vegetable transplants, all sold through the Tribe's wholesale and retail operations. If you are interested in xeric landscaping, please be sure to take a look at our Native Plant Section. Copyright © 2001, The Pueblo of Santa Ana.